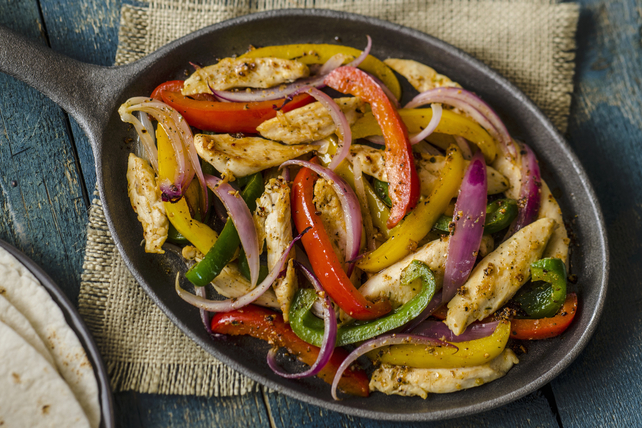 Our Chicken Fajita Skillet is a great choice for a weeknight dinner. The DIANA Marinade Spicy Southwest adds a big kick of flavour and just the right amount of heat to this family favourite. Pour marinade over chicken in shallow dish; stir to evenly coat chicken with marinade. Refrigerate 30 min. to marinate. Heat half the oil in nonstick skillet on medium-high heat. Add peppers and onions; cook and stir 3 to 4 min. or until crisp-tender. Transfer to bowl; cover to keep warm. Heat remaining oil in skillet. Add chicken mixture and garlic; cook 5 min. or until chicken is done, stirring frequently. Return vegetables to skillet; cook and stir 2 min. or until heated through. Serve wrapped in tortillas. Spoon chicken mixture onto tortillas; top with salsa, sour cream, chopped fresh cilantro and/or Cracker Barrel Shredded Tex Mex Cheese before rolling up.